Before the 2013 Spring Festival 春节, the People's Bank of China named the Singapore branch of the Industrial and Commercial Bank of China the clearing bank for yuan in Singapore. China sees Singapore as its regional partner for the extension of yuan internationalisation. The aim is that the emergence of new offshore centers will expand the existing regime instead of creating competing systems. So far, Hong Kong has had a good eight-year head start and remains the dominant offshore center of the Chinese currency, handling around 80pc of offshore trading. Once the clearing mechanism is set up in Singapore, there will be greater transparency in the movement of yuan funds. Singapore will be the gateway for China in the Southeast Asia, which provides a platform for Beijing to facilitate wider use of yuan in trading with Southeast Asian nations. At present, a cross-border trade settlement scheme is driving liquidity into 人民币 offshore markets. The size of the offshore 人民币 liquidity pool a financial centre can generate, therefore, largely rests on bilateral trading volume. Compared with Hong Kong, which had $283.5bn of bilateral trade with mainland China in 2011, the UK’s trade with China was only worth $58.7bn. Further, the 人民币 is barely used as a trade settlement currency in UK-China trade. London is therefore limited by liquidity concerns, even though it hosts deposits of 人民币109bn. This issue will remain a challenge until the 人民币 becomes fully convertible as an international currency. The City could perhaps attract a significant volume of 人民币 resources through its advantage in global foreign exchange trading. But, for as long as the cross-border trade settlement scheme remains the major pillar in China’s 人民币 strategy, the City will not be a become a big player. A second stumbling block is the technical difficulty caused by the 人民币 clearing system. In the offshore 人民币 market, up until now only Hong Kong has been thoroughly equipped with both the 人民币 real-time gross settlement system, which allows swift, large fund transactions, and with a人民币 clearing bank, Bank of China (Hong Kong). London is lacking this critical 人民币 settlement system. It also doesn’t have a local人民币 clearing bank. Even if the City is in a good position to gear up global demand, the majority of those offshore 人民币 transactions still have to be conducted via Hong Kong. As a result, market practitioners see less benefit in concentrating their 人民币 businesses in London. Multinational corporations can simply shift 人民币 deals to Hong Kong branches (or perhaps to Singapore). In other words, until London has the requisite financial infrastructure, it will struggle to be more competitive. Thirdly, and perhaps of most concern, is the differing understanding of Beijing’s 人民币 internationalisation strategy in the Bank of England and the UK Treasury. China’s 人民币 strategy is a policy-driven process, with deep public sector involvement. The most evident example is the role of bilateral currency swap agreements. In Beijing’s view, a bilateral agreement between central banks has profound implications beyond the intrinsic value of the swap itself. It represents a will to jointly develop 人民币 offshore business at the level of officialdom. However, the Bank of England sees limited value in establishing a line in currency swaps. The 人民币 is not yet fully convertible, and the size of its global offshore market is neither large or liquid. The Bank insists that the private sector should take the initiative. It therefore remains reluctant to get involved in the swap issue. The UK Treasury, on the other hand, is making great efforts to initiate policy dialogue with Beijing and Hong Kong. It wants to push the City towards the front tier of the 人民币 offshore business, and thereby boost the economy through a closer relationship between China and the UK. While the development of the offshore 人民币 market remains contingent upon China’s financial reform process, whether the Bank of England and the UK Treasury can take collective action will ultimately determine the City’s future in the 人民币 internationalisation game. 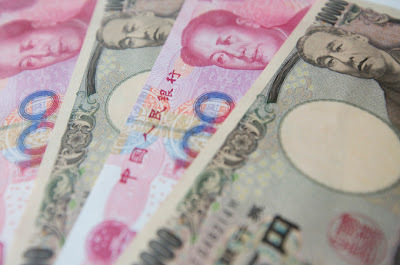 The Geo-Trade Blog will continue to follow closely new developments on the internationalisaltion of the Chinese renminbi 中国人民币.